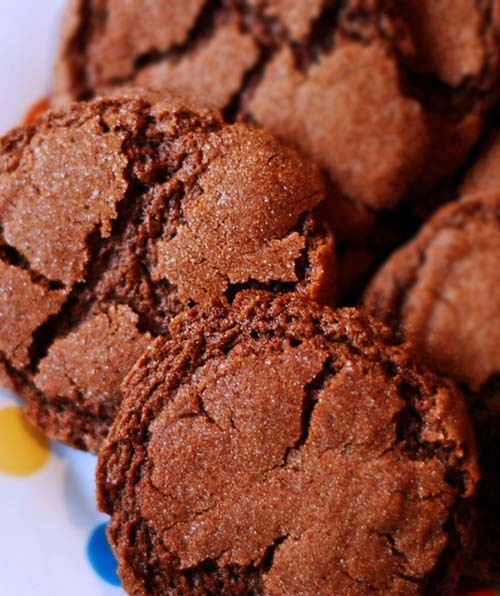 I found the recipe for this spicy Mexican Hot Chocolate Cookies from the video below. Using chile powder gives it a little kick which is great anytime, but amazing for Christmas and the holidays. Good for 4-6 dozen cookies, depending on the size of dough balls you make. In a medium bowl, sift flour, cocoa powder, cream of tartar, baking soda, and salt. In a large bowl, using an electric mixer set to medium, beat butter and 1 1/2 cups sugar until light and fluffy. Should take around 2 minutes. Scrape down side of bowl. Add eggs and beat to combine. Set mixer to low, gradually add flour mix from medium bowl and beat until well combined. In a small bowl, combine remaining 1/4 cup sugar, cinnamon, and chile powder. The video below says that chile powder is optional, but since we’re interested in making hot, as in spicy, cookies, I think chile powder is required. With a tablespoon scoop out and form balls of dough and roll them in cinnamon-sugar mix. On a baking sheet lined with parchment paper, arrange the dough balls about 3 inches apart. Place in oven and bake until cookies are set in center and begin to crack. Should take around 10 minutes. Let cookies cool off completely before serving. Use wire racks if available.